I was thinking wistfully about taking a road trip down to Barcelona, to visit a mate, in the 996 C4S and it turns out the wife and kids are keen to come too! Are we completely insane for contemplating this? Luggage space is one problem. The other is legroom for the kids in the back. We have two boys, 10 and 8 years old, who regularly use the back seats on shortish trips but I'm a bit worried about them being in there for the longer stints. Anyone got any experience of travelling across Europe, fully loaded?! Crazy idea. Buy a Cayenne. I travel down to the South of France once or twice a year. Last time was me, the bird and the dog. So long as the kids can fit in, should be ok. Stop every 4 hours to refuel and stretch and it's fine. Worst bit is driving through the UK. If luggage is a problem, post it with UPS or the likes. Should only be about £20 each way. If the kids were no older than say 6 then you may have got away with it but even then it's a big ask (of them). Longest I've done is 7.5 hours to Cornwall last year but that was just me and the Mrs with the back seats full of luggage and shizzle. Alex Yates. That is genius. Or take two cars. I used to drive to Cornwall in the 993 behind Madam in the Estate car. Or was it the other way round. I'm currently in Lisbon having taken the ferry over to Santander from Portsmouth. Driving around Europe is a piece of p. People make far too much of this. Just get in, close the doors and drive. My GF just suggested sedating the kids with something appropriate. Ketamine should do the trick......and they'll probably enjoy it too. I still do the odd Sunday afternoon spread eagled on the roof of my mates car, trying not to spill my pint......there's a serious knack to not falling off. 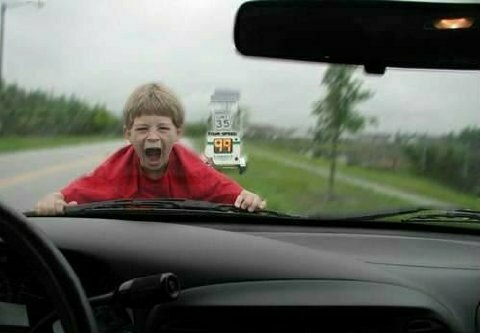 My memories as a child in the back were all down to the driver. Grandparents holiday driving was like watching the Mona Lisa being painted, being with my uncle was like racing James Hunt at Monza! I've driven from midlands to Portsmouth ferry to Bilbao then drove to Nerja (south coast Spain) in a long wheelbase land Rover (twin fuel tanks). Flew back in 2.5hrs. Rode a Yamaha R1 to the Pyrenees mountains. Great experience but not to be repeated. Some vehicles are not designed for long distance comfort. Just like the back seats in a 911 Cabriolet, small, bolt upright, no headroom, no leg room. I suppose the other thing to consider is vehicle breakdown cover in Europe and getting the car back home, if the unfortunate were to happen. Although we take the Boxster or 911 Cabriolet a few times a year to our place in the Vendee, we literally hit the toll roads from Eurotunnel all the way. Take my advice, if you really want to take the 911, take it alone & fly the family to the airport. Get the 911 under something like Porsche Warranty & Breakdown for peace of mind. Get the car serviced, tyres changed for a deep tread if yours are currently 4mm or below. Take lots of fluid to drink it's easy to forget driving hr after hr. Spare light bulb set, alcohol tester, highvis jacket, puncture repair kit (all the things that the European Law says you should have compulsory in your vehicle at all times) . It's very very expensive once you start to add things up, including travel costs. Well for starters, he's going in a coupe. Jeez, you make it sound like they're planning a trip to the moon! If there's 4 in the car - cost is comparable with flying. It's only 800 miles from Calais - should lick that in under 12 hours. Deffo have breakdown cover.